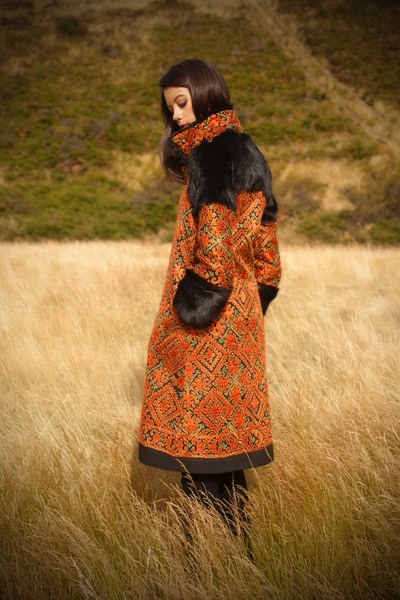 A true heirloom piece, this one of a kind coat is handcrafted from a repurposed vintage woollen dupatta (shawl) with silk embroidery characteristic of Pakistan's famous Swat Valley. This special textile was sourced in Rajasthan, Northern India and makes for a very unique garment. Warm, soft and beautifully finished with fabric covered buttons hidden beneath a placket, and a contrast of orange and green with sumptuous black dyed fur ... wear it and treasure it well for many years to come.